The original Simbang Gabi was called the “Misa de Aurea” (Golden Mass) or the “Angel’s Mass.” In 1587, Fray Diego Soria, prior of the San Augustin Convent, petitioned the Pope for permission to hold Christmastide Masses outdoors because the church could not accommodate the multitude that attended the services. The request was granted through a rescript and in the 17th Century, the Misa de Aguinaldo or the Misa de Gallo, or Simbang Gabi became a Filipino spiritual tradition. Vatican II encouraged the church in the Philippines to continue the tradition and uphold its significant role in the life of the people. This novena of Masses expresses the love of the people for God through His Mother, Mary, as we gather in prayerful anticipation of the Christmas miracle. The readings, the prayers and the songs at Mass remind us all of our need for God in our lives and the necessity of taking time to reflect on our relationships with God and with one another at this special time of the year. Filipino Americans brought Simbang Gabi to the United States and found it to be an effective way to stay connected to their faith. It expresses who they are as a Filipino People, and enables them to share their God-given gifts with the wider Church in the United States. Simbang Gabi draws on the leadership of the Filipino Catholics in the parishes to carry out these special gatherings and to share their religious tradition and culture with the whole parish family. Simbang Gabi is an opportunity for the Archbishop to gather with the parish leadership at St. James Cathedral for a Commissioning Mass to commence the nine days novena. 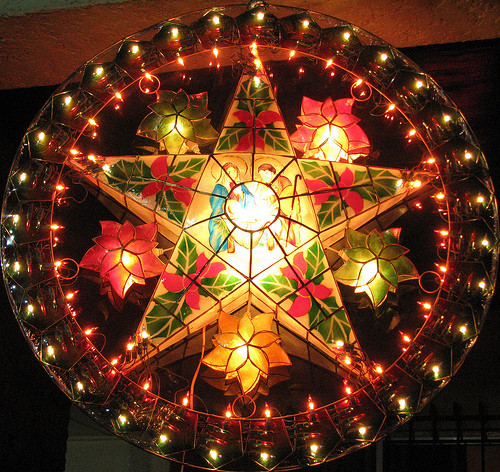 A star-shaped lantern displayed in homes in the Philippines, the Parol is meant to serve as the guiding light and sign for Mary and Joseph and more importantly, Jesus, to come into the home, as the family is ready for them. It is also used as a part of the processional entrance for Mass to remind us that Jesus is the Light of the World bringing life and light to all who accept Him. The Parol represents the star of Bethlehem that guided the magi to the place where Jesus was born. The presence of the star reminds us of God’s presence among us that Jesus is Emmanuel, which means, God is with us.